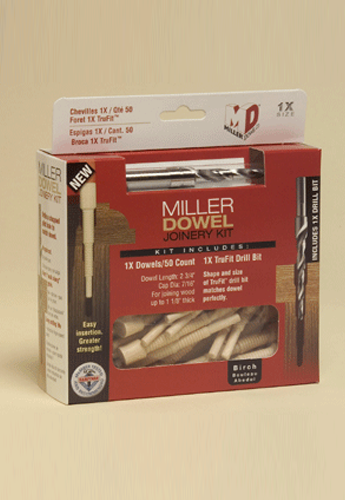 Miller dowels are simple products that can add beauty and longevity to any project. We offer 4 hardwood species, in 3 sizes, and the drill bits you'll need to properly use your new joining components. 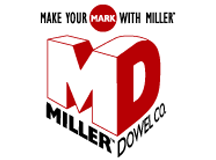 You can count on Miller Dowel Company to deliver the finest products for any woodworker, whether professional or hobbyist. What Is the Miller Dowel? Imagine a stepped, solid-wood structural fastener that forms tight joints all the way through. Unlike other methods of wood joinery, each of these requires minimal tools and can be installed anywhere they're needed in any project from the outside, in. The key to its utility is the unique patented stepped design. The first section acts like a clamp that securely holds the first piece to the second. The second section gives the joint shear strength. The remaining sections bond with the anchor pieces to form a secure joint. The sections are not tapered, which means that the glue surface remains intact through the entire length of the dowel engaging with the wood. • Mini X for Joining Wood 1/2" Stock, with a Max of 3/4"
The stepped design of our dowels is designed to achieve three or more separate parallel diameters. For strength, each one is a radial ledge of 45 degrees. They are turned to a furniture-grade tolerance of +/- .008", and are kiln-dried to a moisture content of just 7% to 9%. Miller Dowels are available in 4 species. 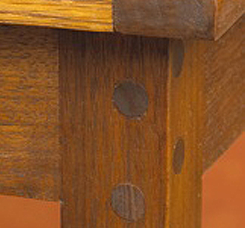 For interior projects, the dowels are available in Red Oak, Black Walnut, Birch, and Cherry. Miller Dowel's TruFit Drill Bits, which are stepped to match a correspondingly sized Miller Dowel, are made from industrial-quality, high speed steel for longer cutting life. They are designed with an aggressive helix and polished flutes for efficient chip removal. Three positive locking flats are ground on the shank to prevent spin-out, and a split point prevents "walking" along the grain. TruFit Drill Bits form precise pilot holes that provide a perfect fit for the parts to be joined.